James Ugochu Ihedigbo (/iˈhɛdiboʊ/ ee-HED-ee-boh; born December 3, 1983) is an American football safety for the Buffalo Bills of the National Football League (NFL). He was signed by the New York Jets as an undrafted free agent in 2007. He played college football at Massachusetts. Ihedigbo played at Amherst Regional High School where he was a two-time All-Western Massachusetts and All-League selection. 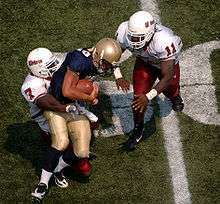 James Ihedigbo(#7) making the tackle while at UMass. James Ihedigbo played football at the University of Massachusetts Amherst from 2002-2006. After arriving in 2002, Ihedigbo redshirted his first year. In the following season, he started 10 of 12 games for UMass, picking off 4 passes, making a total of 74 tackles with 2 forced fumbles and was named the team's most improved defensive player. In 2004 James had 52 Tackles but no interception. In his third year at Massachusetts, Ihedigbo switched to strong safety from free safety and ranked sixth on the team in total tackles with 45. In his redshirt junior year, he was named to the Atlantic 10 conference third team and started at strong safety for a team which allowed the fewest points in all of Division I-AA football. He finished third in the conference in sacks with 7.5. As a senior he had 72 tackles, 5 quarterback sacks, 3 interception and 4 forced fumbles, he was a candidate for the Buck Buchanan Award and a Walter Camp All-American as well as a senior captain. He also received UMass team MVP for 2006. Results taken from Pro Day workout. Ihedigbo attended Jets rookie minicamps and signed a contract with the Jets and general manager Mike Tannenbaum. In the second game of the preseason against the Minnesota Vikings Ihedigbo injured his hand and missed the rest of the season as the Jets placed him on injured reserve. In 2008 Ihedigbo began the season on the practice squad. He was added to the active roster on October 29, 2008 because of an injury to safety Eric Smith. 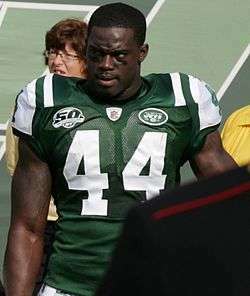 James Ihedigbo recorded his first NFL tackle on November 23, 2008 against the Tennessee Titans in a 34-13 Jets win. During 2008 season he played in 8 games and had 8 tackles. Ihedigbo made the Jets in 2009 as a backup safety. In a 16–13 overtime loss to the Buffalo Bills on October 18, 2009, Ihedigbo and fellow Jet Marques Murrell threw punches at Bills tight end Derek Fine, causing Ihedigbo to be ejected from the game by officials. The NFL fined both players $5,000 and head coach Rex Ryan benched Ihedigbo, along with Murrell, for the following game against the Oakland Raiders. On December 13, 2009, against the Tampa Bay Buccaneers Ihedigbo got his first NFL sack on quarterback Josh Freeman. The Jets going into week 17 had 8 wins and 7 loses and needed one win to make the playoffs as they were playing the Cincinnati Bengals. James Ihedigbo had his best game as a pro with 2 tackles. One of those tackles was a sack and a forced fumble of quarterback J.T. O'Sullivan that was recovered by Jamaal Westerman. The Jets won the game 37–0 and clinched a playoff berth. In the AFC wild card playoff game, the Jets beat the Bengals again, 24–14. In the AFC divisional playoff game, the Jets played the San Diego Chargers. In the fourth quarter of the game, Jay Feely was kicking off to San Diego after a Jets touchdown by quarterback Mark Sanchez. The kick return was taken by Antonio Cromartie but during the return Ihedigbo ripped the ball out of his hands for a forced fumble. The Jets went on to win 17–14. The Jets had made it to the AFC championship game and were one win away from the Super Bowl. James Ihedigbo had 3 tackles but the Jets lost to the Indianapolis Colts, 30–17. James Ihedigbo finished the season with 19 tackles, 2 sacks and 1 forced fumble in 15 games. On March 22, 2010 James Ihedigbo signed a one-year contract with the New York Jets. The Jets were considered by many to be Super Bowl contenders. They opened the season on Monday September 13, 2010 against the Baltimore Ravens in the Jets' new home, Metlife Stadium. Ihedigbo recorded his first tackle of the year but the Jets lost 10-9. James Ihedigbo recorded his first sack of the season in week 4 against the Buffalo Bills and quarterback Ryan Fitzpatrick. He finished with two tackles as the Jets won 38 to 14. The Jets were in first place in their division with a 6-2 record going into week 10 against the Cleveland Browns. James had 2 tackles and his second sack of the year in the fourth quarter. The Jets won the game in overtime when Mark Sanchez threw a touchdown pass to Santonio Holmes for the victory. In week 12 The Jets were playing the Cincinnati Bengals on a Thanksgiving game on the NFL Network. Late in the 3rd quarter Steve Weatherford punted a ball that touched one of the Bengals players. Ihedigbo noticed this and jumped on the ball giving the Jets the ball. Later on that drive because of Ihedigbo fumble recovery the Jets scored on a touchdown pass from Mark Sanchez to Santonio Holmes. The Jets won 26-10 and push their record to 9-2. This kept them in first place, tied with the Patriots. The next week the Jets were tied for first place with the New England Patriots and playing their game in New England. James Ihedigbo sacked Tom Brady late in the 1st quarterTom Brady but the Jets struggled all night as the Jets lost 45-3, dropping them out of first place. The Jets ended the season with 11 wins and 5 loses and finished in 2nd place in the AFC east behind the Patriots. The Jets won the AFC wildcard playoff game 17-16 over the Indianapolis Colts. Then in the AFC divisional round the Jets played the New England Patriots. Ihedigbo would have 2 tackles as the Jets would upset the Patriots 28-21 to get to the AFC championship game. Next week the Jets lost to the Pittsburgh Steelers and missed the Super Bowl by one game for the second straight year. James Ihedigbo ended the year with 22 total tackles and 3 sacks. After the NFL lockout ended Ihedigbo became a free agent. The Jets had three free agent safeties: Brodney Pool, Eric Smith, and James Ihedigbo. The Jets decided to sign Pool and Smith and let Ihedigbo go. Ihedigbo signed with the New England Patriots on August 19, 2011. James Ihedigbo got his first tackle with the Patriots in Week 2 against the San Diego Chargers. In his first game against his former team the New York Jets Ihedigbo had a career high 6 tackles in a New England win 30-21. Two weeks later playing the Pittsburgh Steelers he had eight tackles in one game, which was a career-high for him. Ihedigbo became a starter with the Patriots after a number of other defensive backs were either cut or injured. Prior to the start of the season, Pro Bowl safety Brandon Meriweather as well as fellow starter James Sanders were cut. In Week 10, The Patriots played the Jets again, and Ihedigbo lead the Patriots with seven tackles as New England won 37-16. Through ten games in the 2011 season, Ihedigbo started 6 games and made 42 tackles. At the end of the regular season the Patriots went 13-3 and had the best recorded in the American Football Conference. In the Divisional Round of the playoffs, Ihedigbo had seven tackles in a 45-10 win over the Denver Broncos. The Patriots made the AFC Championship game and played the Baltimore Ravens. James Ihedigbo had eight tackles and a sack in that game. The Patriots would win 23-20. Before the Super Bowl, Coach Bill Belichick said that James Ihedigbo would start at safety in the Super Bowl. James Ihedigbo started the game and made five tackles but the New England Patriots would lose to the New York Giants 21-17. Ihedigbo played all 16 game in 2011, starting in 12 of them. He had a career high in tackles with 69. His 69 tackles was the 5th best on the Patriots for that season. Ihedigbo was re-signed June 22, 2012. He was released after the end of the 2012 NFL preseason, on August 31, 2012. On September 2, 2012, Ihedigbo signed with the Baltimore Ravens. In his first game as a Raven, Ihedigbo recorded two tackles in a win over the Cincinnati Bengals. In week 3 of the 2012 NFL season, the Ravens played the New England Patriots, the team that had released Ihedigbo at the beginning of the season. Ihedigbo played in the game but mostly on special teams. The Ravens won 31-30 to increase their record to 2-1. After the game Ihedigbo said "Anytime you get a chance to go against your former team, it's kind of personal". "I went into this game with that kind of mentality and when you put the history of these two teams on top of it, it just became a very personal and emotional thing. It was great the way it turned out. It couldn't be any sweeter. We just persevered through everything, all adversity that took place in the game from the things that were in our control, the penalties and the things that were outside our control," Ihedigbo said. "When it all accumulates in a win, we're very excited." The Ravens faced the Patriots again in the AFC Championship, the fourth season in a row that Ihedigbo played in the AFC Championship. The Ravens beat the Patriots 28-13, and qualified for the Super Bowl for the first time in 12 years. The Ravens defeated the San Francisco 49ers, 34–31, in Super Bowl XLVII. On March 12, 2013 it was announced that the Baltimore Ravens re-signed James Ihedigbo to a one-year contract. At the end of the 2013 pre-season coach John Harbaugh announced that Ihedigbo would start at safety in week 1 for the Ravens. In the second quarter in a game versus the Cincinnati Bengals, Ihedigbo got his first career interception from Bengals quarterback Andy Dalton. Later in the 4th quarter of the same game Ihedigbo intercepted Dalton again. He also recorded 9 tackles. On March 24, 2014, Ihedigbo signed a two-year contract with the Detroit Lions. On November 15, 2016, Ihedigbo was signed by the Buffalo Bills. Ihedigbo was born to Rose and Apollos F. Ihedigbo, immigrants from Nigeria. Ihedigbo has three other brothers, Emeka, Nate, David and a sister, Onyii. Ihedigbo founded the HOPE Africa Foundation in 2008 to help provide educational services for underprivileged communities in Africa. The foundation offers a wealth of assistance to these communities in the form of scholarships, mentoring, funding, and developmental projects. Ihedigbo is also involved in the Nigerian Agricultural Technical Community College, founded by his parents. 1 2 3 4 5 "Player Bio: James Ihedigbo :: Football". Retrieved 19 December 2011. ↑ Drape, Joe (May 16, 2007). "Sports Briefing". nytimes.com. NYTimes. Retrieved 15 September 2012. ↑ "Jets' LB Harris doubtful, S Smith out vs. Bills". seattletimes.com. seattletimes. Retrieved 15 September 2012. ↑ Matthews, Wallace. "Jets defense smothers Buccaneers". newsday.com. newsday. Retrieved 16 September 2012. ↑ Cimini, Rich. "New York Jets roll Cincinnati Bengals, 37-0, to clinch playoff berth and set up Wild Card rematch". nydailynews.com. nydailynews. Retrieved 16 September 2012. ↑ Cannizzaro, Mark (January 18, 2010). "Jets upset Chargers, will face Colts in AFC Championship". nypost.com. nypost. Retrieved 16 September 2012. ↑ Cannizzaro, Mark (January 25, 2010). "Jets crash in second half, lose to Colts 30-17". New York Post. Retrieved 16 September 2012. ↑ "Jets: Three sign tender offers". recordonline.com. recordonline. Retrieved 16 September 2012. ↑ "Resurgent LT runs over Bills as Jets roll 38-14". Yahoo.com. Yahoo. Retrieved 16 September 2012. ↑ "Jets beat Browns in final seconds, 26-20". newyorkpost.com. newyorkpost. November 14, 2010. Retrieved 16 September 2012. ↑ "NFL: Ihedigbo, Smith's efforts lift Jets over Bengals". thepeninsulaqatar.com. thepeninsulaqatar. ↑ "Brady, Patriots rout Jets 45-3". Yahoo.com. yahoo. ↑ "Jets cornerback leaves quiet Brady eating 'Cro". New York Post. January 17, 2011. ↑ "42 Years and Counting: Jets Lose to Steelers 24-19". nbcnewyork.com. nbcnewyork. ↑ "Ihedigbo leaves Jets". gazettenet.com. gazettenet. ↑ Howe, Jeff (August 19, 2011). "Former UMass Star James Ihedigbo Signs With Patriots". New England Sports Network. Archived from the original on August 19, 2011. Retrieved August 19, 2011. ↑ "Jets lose to Patriots, drop third straight". newsday.com. newsday. ↑ "Patriots beat Broncos 45-10 in NFL playoffs". foxnews.com. foxnews. January 14, 2012. ↑ "Patriots Beat Ravens 23-20 in AFC Championship Game". foxnews.com. foxnews. January 22, 2012. ↑ "James Ihedigbo honored to be part of Super Bowl as starter for Patriots". gazettenet.com. gazettenet. ↑ Maske, Mark (February 8, 2012). "Super Bowl 2012: Giants beat Patriots 21-17 in a heartstopping repeat of 2008 title game". WashingtonPost.com. WashingtonPost. ↑ Ravens Sign Safety Safety James Ihedigbo Retrieved 2 August 2012. ↑ "Ravens defeat patriots 31-30 on late FG by Tucker". Yahoo. Yahoo. Retrieved 20 October 2012. ↑ "James Ihedigbo savering win over Patriots". Baltimoresun.con. Baltimoresun. ↑ "James Ihedigbo, Baltimore Ravens agree to contract". nfl.com. NFL. ↑ Wilson, Aaron. "Gradkowski, Ihedigbo named starters by Harbaugh". www.baltimoresun.com. baltimoresun. ↑ "Ravens' James Ihedigbo comes back after 'bone-head move' to make critical play". baltimoresun.com. baltimoresun. ↑ Brown, Chris (November 15, 2016). "Bills add S James Ihedigbo; Duke Williams released". BuffaloBills.com. Wikimedia Commons has media related to James Ihedigbo.